“If this book didn’t belong to the library, I would chop it up and burn it.” With that comment, my cookbook club commenced its second meeting. The complaint came from my friend Brian Harvey, who had spent the past three days carefully following the banh mi recipe in chef David Chang’s cookbook, Momofuku. Like many of Chang’s recipes, the dish was more complicated than it first appeared and turned out to be four recipes in one. Everyone else in the room could commiserate. We had all made dishes from either Chang’s book or Momofuku Milk Bar, by pastry chef Christina Tosi. My partner and I had spent the past two days sourcing ingredients for Tosi’s cereal milk ice cream pie. Unlike the majority of ice cream recipes, Tosi’s dessert calls for glucose (to add body and reduce crystallization) as well as corn powder (an uncommon ingredient she’s particularly fond of). We eventually found the glucose at a bulk food store and personally ground by hand freeze-dried corn we tracked down at a camping store. The work involved was plentiful, but when the final dish was set on the table, the spread was impressive. 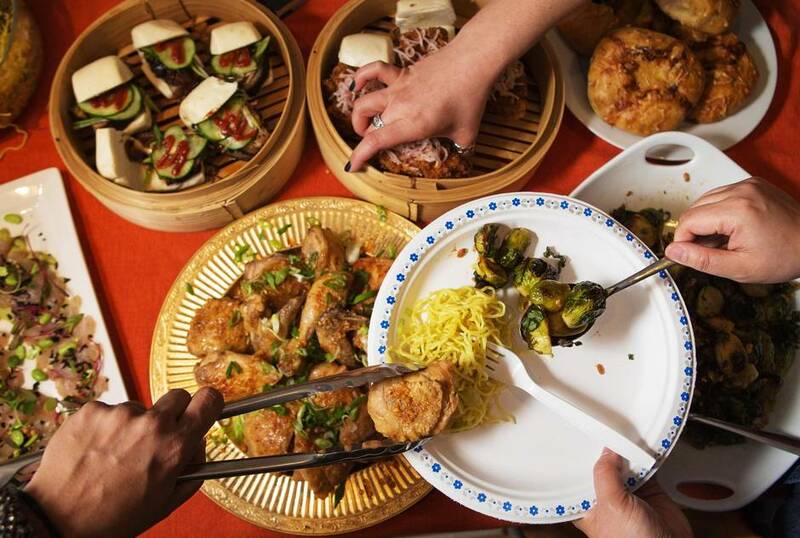 There was fried chicken, ginger scallion noodles, pork buns, Brussels sprouts, Tosi’s famous crack pie and more. It was just like I had gathered at one of the Momofuku restaurants with 15 of my friends and family, but without having to awkwardly split the bill at the end of the meal. Cookbook clubs are the new potlucks. 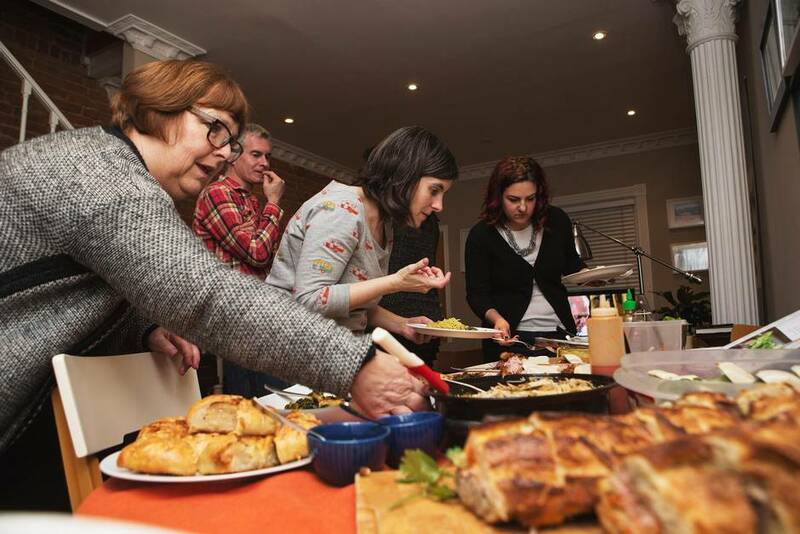 The idea of sharing the work involved in having people over for dinner is sweet, but too often means eating a disjointed dinner that circled the globe, with samosas, shepherd’s pie and chow mein all on one plate. A club allows members to create a unified menu of dishes from an agreed-upon cookbook. We spread out the work, then enjoy a cohesive meal together, socializing and comparing notes, collectively reviewing the book. Well-trafficked blogs such as The Kitchn and Serious Eats have featured articles encouraging readers to join the movement, the latter proclaiming that “cookbook clubs should be the new way we entertain.” The timing is fitting now that chefs are household names with the celebrity status previously reserved for the best athletes or movie stars. It’s also a way to actually use the beautiful cookbooks that attract our attention at bookstores – in 2015, cookbook sales at Indigo were up 9 per cent over the year before. But if most Canadians are anything like me, they buy those cookbooks and then don’t use them. I have more than 100 in my collection, and I am guilty of ignoring most of them, referring to the same handful time and again, gravitating to recipes I already know. My three-month-old cookbook club has been a way to force myself to try new techniques and more advanced recipes. For the first meeting, in January, the group settled on a classic, Julia Child’s Mastering the Art of French Cooking. I roasted a duck for the first time. Even though the meat turned out more rare than I aimed for and I failed to carve the bird the way Child had meticulously instructed, I was still proud to present the dish at the table. As with every new challenge overcome, I felt accomplished and much more prepared for my next crack at the finicky fowl. Gorgeous collections of recipes and photos have always been a conversation starter, says Alison Fryer, former manager of the now-closed but still beloved Cookbook Store in Toronto. “Total strangers would come together in the store over a cookbook. Somebody would pick up, say, a Yotam Ottolenghi book, and they’d just start talking about what they made out of it and what they liked about it,” she said. Fryer, who is now an instructor at George Brown College, says she had always wanted to try a cookbook club at the store but was limited by its small space. “Having a cookbook club is a great way to share in a non-intimidating environment,” she says. 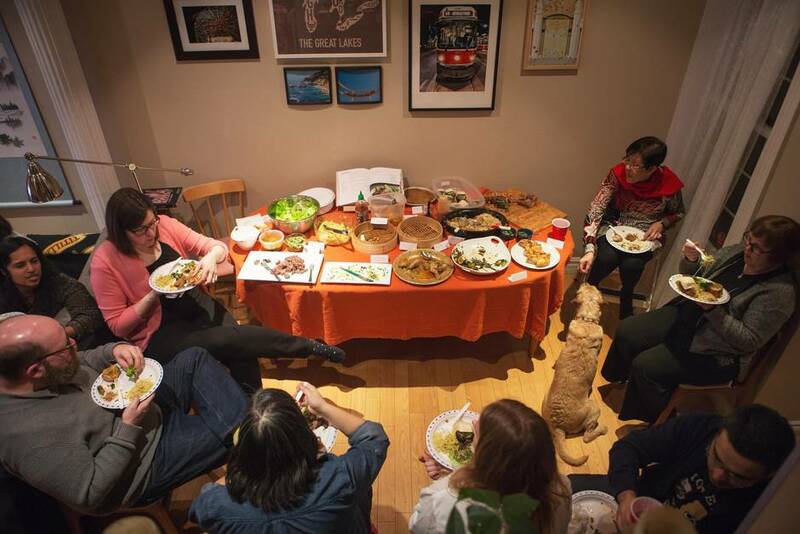 “It’s not like you’re doing the whole dinner party and the stress level that goes with that.” Though, as anyone who has hosted a large potluck can attest, they can sometimes be more stressful than just cooking an entire meal. There’s always someone who needs to put the finishing touches on their dish or takes up the entire kitchen island with their uncut crudités. Some cookbook clubs serve all dishes at room temperature to prevent a lineup for the oven, but we allow some contributions to be reheated. Meals are stalled when dishes take their turns under the broiler, but nobody wants their masterpiece cold and congealed. Still, a degree of kitchen order must be maintained. 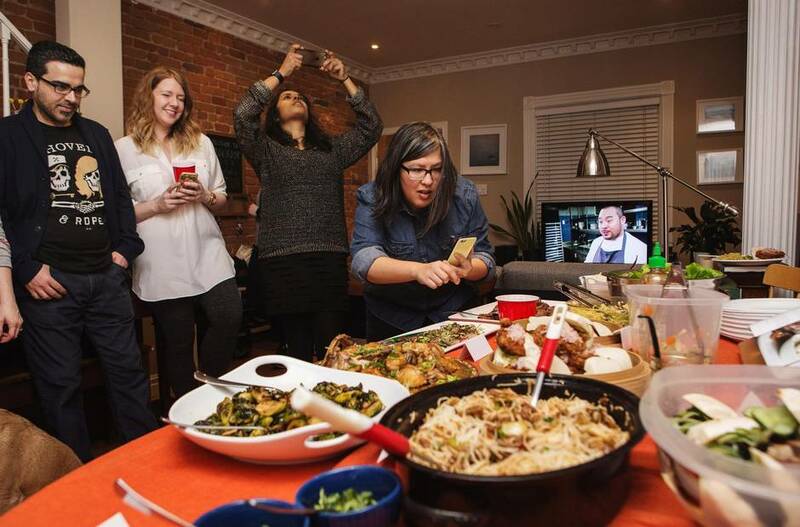 Hosting a cookbook club functions best with rules. At the very minimum, guests should provide all the serving dishes needed for their dish and then make sure that hosts aren’t left with a sink full of unrecognizable platters. There are about 20 members in my group, which so far has only met at my house. About a dozen people have shown up to each meeting, which is manageable. Others have asked about joining, but my house is too small. Even if it were bigger, more than 30 members would be just too unwieldy (and, maybe, produce too much food). At the last meeting, when it was time to dig into supper, we lined up to spoon the creations onto paper plates, just enough so we could taste every dish. “I like that people took the cooking seriously but didn’t take the talking about food seriously,” said one participant. Most of us expressed a new appreciation for Chang and his fellow chefs: Restaurant prices seemed more reasonable now that we understood the arduous process behind making ramen broth or the mother dough for Tosi’s renowned volcano buns filled with scalloped potatoes. The experience was a reminder that a simple noodle dish or sandwich is not always as easy as it looks. The exception was Brian, who displayed his banh mi sandwiches beautifully on a wooden butcher block, then declined to eat one. “I drew the line at dipping each and every ham cube in the fat slurry,” he said as he bitterly recalled an entire evening spent making the ham terrine. He watched as others picked the sandwiches up, but he was still too angry.